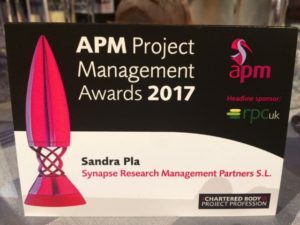 The APM Project Manager Awards 2017 were held on the 20th November at Old Billingsgate, London. The awards recognize the very best the profession has to offer. The EPAD project (European Prevention of Alzheimer’s Dementia Consortium) was one of the six finalists in the “Social Project of the Year” category, and the only finalist among all category finalists, representing a research project in the medical field. 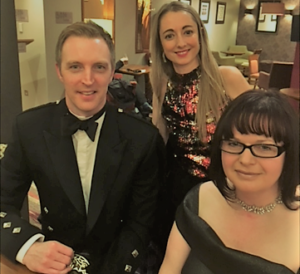 Sandra Pla from Synapse, with EPAD representatives from IQVIA and the University of Edinburg attended APM Awards evening. 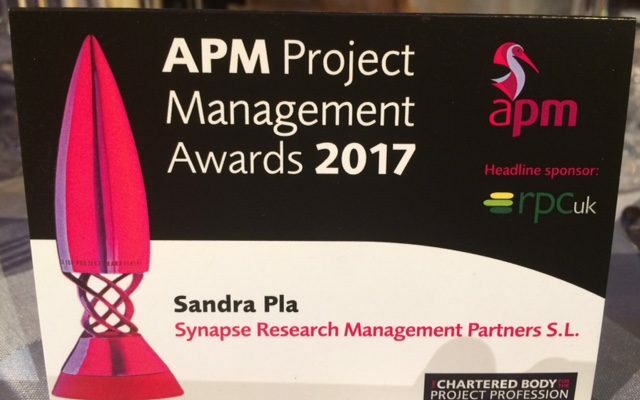 It is an enormous accomplishment for EPAD and Synapse to be one of the finalists since Synapse is responsible for the project management of this ambitious and ground-breaking research initiative in the field on Alzheimer. “We felt very proud to be able to present our project at such distinguished occasion” assures Sandra. Synapse is member of the Association for Project Management.